Usually, when I'm asleep, I'm dreaming of beautiful sandy beaches and matching girls. For some days now, these dreams have changed. A continuous voice keeps whispering stories about Iko Iko, a small island on Agaia, an inhabited planet in our solar system. Bombaman really has got me in its grip. The intro of the game tells a horrifying story about a deadly habit amongst The Bomba, one of the three tribes living on the island. Their God Razat has taught them to deal with life and death in a very questionable way. Somehow, people seem not to bother and take the situation as it is. Fortunately, there is a young man who dares to stand up and starts thinking differently. Is it possible to change the flow of time? Is it possible to change history? Welcome to a story of hope, welcome to Bombaman. In 1983, Eric And The Floaters saw its daylight. It was the start of a new genre in gaming: walking around in a playfield, loaded with bombs and encountering a lot of enemies. By cleverly placing these bombs you can kill the enemies but the risk of being hit by your own bomb is high. You have to act smart and fast. Over the years, many versions of the game have been released. The most popular was undoubtedly Bomberman for the Super Nintendo. Bombaman is a new bomberman game for MSX. The special collectors' edition of Bombaman is being distributed by Sunrise and comes on two diskettes. One can play the game from these disks, but it is also possible to install the game on your harddisk or Compact Flash card by copying all the files to a dedicated directory. Team Bomba, the developers of the game, have used an advanced way of disk accessing which has first been introduced by Fuzzy Logic. All the game data is compressed in large library files. This makes loading data very fast. Together with the game comes a CD-ROM on which you can find a lot of extra's, such as Bombed, the Bombaman Level Editor, a complete dump of the Bombaman website and all the Moonsound music from Bombaman in MP3-format. And as if that isn't enough, the CD-ROM also contains several other games previously released by Sunrise such as The Lost World, KPI-Ball, Blade Lords, The Blue Warrior and Match Maniac! All this is packed in a beautiful DVD case, together with the Bombaman manual. The game itself is very advanced and offers three game modes: a Single player mode, a Multiplayer mode and a Custom mode. In this last mode, it is possible to create your own levels. Team Bomba have opened a dedicated website on which a real Bombaman community can rise. Here, people can upload their homemade levels which other Bombaman freaks can play. This offers huge possibilities and hopefully will bring a lot of fun. In the Single player mode, you get to play the whole adventure of Bombaman, The Quest On Iko Iko Island. You will have to explore six worlds, each world consisting of ten levels. There are a lot of enemies and nasty boss monsters. While exploring Iko Iko Island, the true story behind The Bomba tribe and their history and habits will be unfolded. The game is password based. Practically, this means that after clearing five levels you get a password, so there is no need of starting all over again each game. There are three kinds of objectives to clear a level. The most common objective is to simply kill all enemies in the playfield. Another way of clearing a level is collecting certain gems. Third way is destroying all crystals. After having done this, the exit appears through which you can reach next level. To make things even more challenging, you have limited time to finish each level. You will have to clear the level before the timer hits zero. At the start of a level, it's not being displayed which of the mentioned three ways you will have to follow. This has sometimes confused me, but mostly, I got the hang of it pretty soon. In the playfield there are a lot of items to be found. Some items slow you down or speed you up, other items make your controls reverse for sixteen seconds, there are items which make you invisible and there are of course items which give your bombs extra firepower. I could go on and on, Bombaman really has an extensive set of items, together they give the game a true professional feeling. Bombaman has multiple difficulty settings. After selecting the New Game option, you can choose between Easy and Normal. When you have finished the game in Normal mode, an extra Hard mode becomes available. I must say I have played the game in Easy mode and even then, some levels are really difficult. There are some very nasty enemies which already appear pretty early in the game. So don't expect you can finish Bombaman in Easy mode quickly! The true success of Bomberman has always been Multiplayer gaming. Team Bomba have recognized this and they made a very cool Multiplayer mode in Bombaman. You can challenge up to four friends for true death matches. What do you say? You don't have friends? No worries, it is also possible to play against the computer. In Multiplayer mode, a lot of extra items are available, nagging becomes a true art! You can adjust many settings before starting a multiplayer game, like the amount and type of items that can be found in a level, the graphics and area and more. Due to the background graphics it is sometimes difficult to read the texts on this multiplayer settings screen. Language has often been a problem in MSX games. Not in Bombaman, as the game comes in English, Dutch, Italian, Japanese, Spanish and Portuguese. This way, a high percentage of MSX users can enjoy the game in their native language. You can easily change (and save) the language to be used in the settings screen. Unfortunately the main menu and all settings screens themselves remain in English after changing language, which might be a bit difficult for several Japanese users. The most important thing however, is that almost every MSX user is capable of understanding the story of the game, thanks to these multilingual options, which add to the professional character of the game. It clearly shows Team Bomba have understood what the international MSX Community is all about. 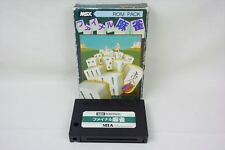 Bombaman isn't the first bomberman game for the MSX platform. I remember I have reviewed a bomberman game for MSX Computer & Club Magazine in the late 90s. Back then, I did like it, it came nowhere close to the Super Nintendo version though. A good bomberman has to have smooth controlling, sparkling graphics and a lot of speed. Bombaman truly has it all! It's pretty obvious Team Bomba went all the way. They've spent more than five years developing the game and it shows off. The intro hits you right in the face. The story is intriguing, it really catches you. In a true RPG-style, you're being placed in some village and you simply can't wait to start exploring. Therefore, Bombaman is much more than just an action-based puzzle game. It has a real story, many RPG elements and still has all the fun action of a typical bomberman. In Multiplayer mode, this is not different. The players are moving around smoothly, with high speed and with cool animations. The bombs explode with great visual impact and this all is very important for the overall gaming experience! Bombaman is developed for the MSX2 with at least 128kbyte RAM and 128kbyte VRAM. This is the minimal configuration, though. Adding an FMPAC, a Music Module or even better, a Moonsound, gives you a fantastic sound experience. The music fits the flow in the game perfectly. They obviously have given this aspect a lot of attention. The Moonsound is supported in a very cool way. Sound effects are being played through this device and the PAN-controller of the OPL4 is being used in the most effective way. When a bomb explodes in the left of the screen, you'll hear the explosion coming out of your left speaker. Ain't that awesome? What can I say. The overall impression I have is that Team Bomba really have gotten into this, they've tried to make a professional MSX game with all the possibilities you can expect from modern gaming. There are extensive menus in which you can change a lot of settings, such as the sound chip to be used, the adjustment of the screen, the difficulty of gameplay etcetera etcetera. The graphical level of the intro, the worlds, the levels and the action on the screen is very high. When I add this up to the fantastic sound support, the well worked out story and most important, the outstanding gameplay, I simply must conclude that Bombaman is a true masterpiece which deserves to be played by every single MSX freak on this planet. What are you waiting for; order it at Sunrise right now! And all this for only 14 euros. A must-have for every MSX user! "Bombaman isn't the first bomberman game for the MSX platform. I remember I have reviewed a bomberman game for MSX Computer & Club Magazine in the late 90s. Back then, I did like it, it came nowhere close to the Super Nintendo version though." That was our game: Bomberman.. made by Paragon to be complete.